Felted bags vs Wynn filter? Felted bags are much cheaper than Wynn filters- are they just as good? Also, assuming i have 600 dollars to spend on dust collection, what would be the best setup? I won’t be exhausting outside and don’t mind wheeling the dust collector to every machine. I’d like to get rid of as many fine particles as possible. I see the HF DC mentioned a lot as an option but I rather avoid HF. look at the forums and go on (what does adequate dust collection mean) it’s a big discussion on this subject. When you ask “just as good”, there’s a lot of variables that will go into any reply. Really good felt bags can filter very fine dust effectively. What would probably happen is they will clog more quickly and that reduces air flow. Less air flow means less dust capture at the point of pickup. Really, really good felt bags (like those form AFF) are supposed to avoid this (dust cake buildup). AFF claims the cake will build to a certain level (needed for the fine filtration) and then the excess will just fall off. I had an AFF bag and believe that happens, but that didn’t stop me from cleaning it once or twice a year….a super messy job. But filters will clog also, ad cleaning them can be a pain as well. It may take longer, but it will happen unless you have some kind of 2 stage system. Even then, the filter will clog. Jet 1100C Canister collector. I hated the bag – total mess and ended up with a lot of very fine dust in the air. Also the canister is shorter than an equivalent bag which was important to me because of space limitations. The canister is 2 Micron and works well for a single stage. It is a bit more than your $600 more like $750 but Jet regularly runs 10% t o15% off sales. And if you haven’t yet, do a search – there are a ton of other threads that address every aspect of dust collection. 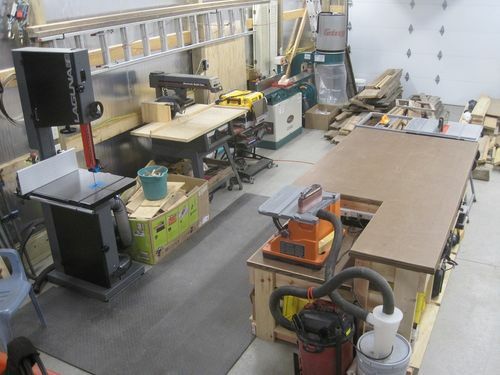 How big is your shop? Felt vs pleated paper filters – for equivalent filtration (same micron rating) and same given size envelope of filter the pleated element will run significantly longer before reaching a given pressure drop due to a much larger surface area. I suspect you will not be able to find a dc for $600 that maintains your health. Look up Bill Pentz site for guidance (takes a while to weed through). The design of the collector at the machine is very important. 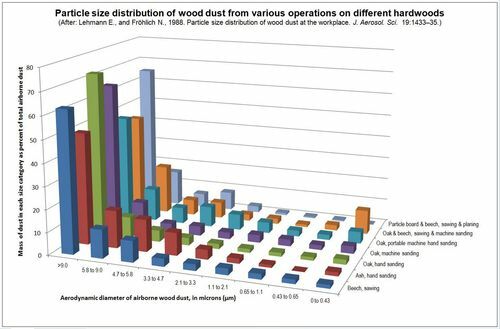 Another approach is get a good respirator and focus on visible chip/big dust collection – dc for housekeeping respirator for health. Lot lower $’s. My cyclone has a 8’ tall/long felted bag. Thing is amazing. Old school for certain. Whack it now and then so the dust falls to the bottom, but the surface area is so large that clogging is not an issue. Annual trips outside to be emptied and knocked out while inside out are free. That said, I am just going to one day vent the exhaust outside for simplicity (with adequate inflow allowances so the room is not air starved). I have felted bags from Highland Woodworking on my HF unit. Bags top and bottom. They work just fine (no pun here) for me. Empty, beat ‘em a bit, install, done. Oh, don’t wash ‘em. Pleated are a lot less messy to empty and in theory require less frequent cleaning. Effectiveness I think really depends on the specific product. There a good and bad of both. That HF unit is a good entry point if you are in a situation where you need to get dust management started but don’t have the ability to go all out yet. The canisters are more effective than the bags. The bag that comes with the HF collector is 5 micron. 5 micron is just a chip collector and the invisible bad for your lungs dust is just blown in the air. You would be just as good with a broom and dustpan as you would be with the HF collector. IMO a 1 micron canister filter on a 3HP collector is the minimum along with an air filter that captures down to 1 micron and a HEPA wearable dust mask when sanding. Even if some of the very small particles pass thru the DC filter they are away from you and the air filter will catch them. I replaced my Jet AFS-1000B filter with the Wynn filter and it collects MERV 14 95% ASHRAE (99.6% at 5.0 microns, 92% at 1.0 microns, 79% at 0.5 microns). It is not cheap but is my comfort level. If is the < 10 micron particles that effect your lungs. Take a look at the attached. Interesting info. Get a super dust deputy and a Wynn filter. You’ll rarely have to do anything to the filter, and the air will be noticeably cleaner. and replaced the bags with Donaldson filters? Well, the filters have to breathe enough air to allow the machine to function (the air flow thing). Having them be too small would be like trying to run it with clogged bags. So be sure to size the Donaldson filters appropriately. With 2.5 micron bags…they do need to be replaced with something. When it came time to move up from my shop vac / Dust Deputy combo to a shop dust collection system I looked at the bag filter DC options but after some research decided that the canister filter was a much better choice – particularly for it’s improved filtering capabilities (and hence a more healthy atmosphere). 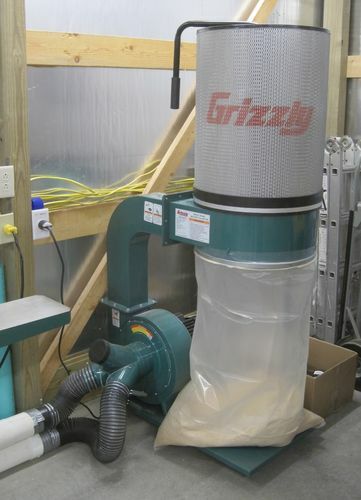 I’m not sure what your overall dust collection requirements are (particularly in regard to your flow rate needs and the number of machines that you will be running simultaneously), but personally I have found my 2hp Grizzly G0548Z with 1 micron canister filter to be a great unit that I can recommend. I have the Grizzly connected to two 4” PVC pipes (that were left-over from a previous project) and while I considered eventually upgrading to a single 6” line, the set-up has performed very well and I plan to stay with it. The first line runs to a blast gate that wye’s to two 4” flexible hoses that connect to the dust ports at the Band Saw, and there is an additional wye midway in the line that has a blast gate connected to a hose for the Jointer. The second line runs to a blast gate with a hose connected to a homemade shroud for my Radial Arm Saw, and there is an additional wye in the line with a blast gate connected to a muli-use 4” flexible hose. The multi-use hose connects to the table saw, planer, or other items as needed. With my typical work configuration, I will either only have the blast gate open to the machine I am using, or when frequently going back and forth between two machines, will leave two blast gates open (most frequently, one on each of the main lines which is why certain machines are on certain lines) and the collection has been great in each use. If you are going to be running three or more machines simultaneously (with open dust ports), a 3 hp unit might be something to consider, though for anything less, it would seem that the G0548Z could be adequate (and with better filtering). Having the DC in a permanent and out-of-the-way spot and plumbed to the collection points can be quite beneficial, particularly compared to the hassle of moving a DC between machines. A cyclone can be a nice addition and do much to collect the sawdust before it gets to the filter and DC collection bag. The filter cleaning handle does a good (and clean) job of cleaning the filter on the Griz. I have a Super Dust Deputy but haven’t incorporated it into my system yet. For convenience, I removed the power switch from the Grizzly and located it to an easy-to-reach spot on the wall near my equipment. The switch is wired to a receptacle that supplies power to the DC that is left plugged in there. I like your shop setup. All my machines are very close to each other so wheeling the DC around isn’t a big deal. I only plan to run one machine at a time as well. That 2HP unit you posted looks good as well. So now Im thinking between that 2HP unit or the 3HP unit and then upgrading the filters.